For the fifth time the Center for Transnational Law (CENTRAL) in cooperation with the German Institution of Arbitration (DIS) organized the Cologne Summer Academy on International Commercial Arbitration. 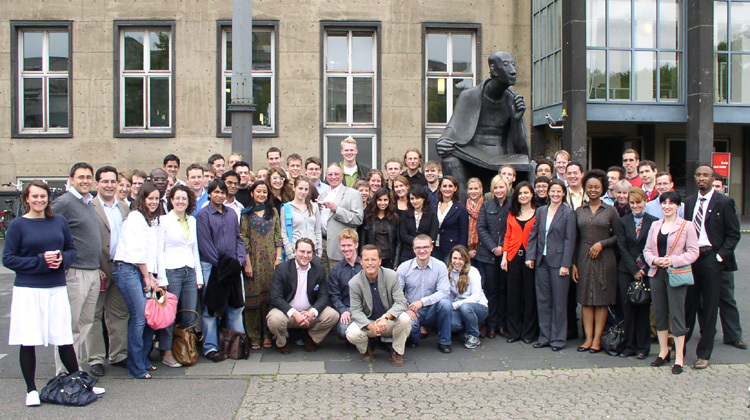 A group of students and practitioners from many different countries spent the week from the 2nd to the 6th September 2007 at Cologne University to learn about the case of Alpine Laseroptics Technologies (ALT) vs. Nederlands Transcontinental N.V. (NedTrans). On the first day the basic concept, tasks and techniques of arbitration were introduced by Isabel Mulder, the Deputy Secretary General of the DIS and Prof. Dr. Klaus Peter Berger, LL.M. 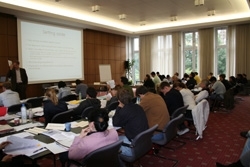 The first lectures provided an introduction into the nature of arbitration and the hierarchy of rules. From the beginning on the lectures were highly interactive and videos from the DVD to accompany Prof. Berger"s textbooks about the case were integrated to give participants a demonstrative example of the practice of arbitration. In the evening the participants had the opportunity to experience the old city centre of Cologne in a guided tour followed by traditional food and drinks in a Cologne "Brauhaus". 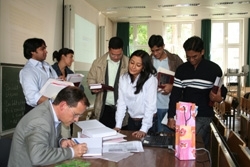 The second day provided the first role-playing exercises for the panellists and parties. The workshop leader Sylvia Noury, an experienced arbitrator, was able to convey the importance of well-prepared statements in the arbitration proceedings as well as the notion to be constantly able to think on your feet and to react to the unforeseen. The second day was concluded by the traditional Academy boat trip on the river Rhine, giving the participants and lecturers the opportunity to relax and socialize. On day three, Prof. Martin Hunter and Prof. Berger lectured about the taking of evidence. They were able to make the academy and the overall learning process very entertaining by combining the serious lectures with interesting anecdotes of their practical arbitration experiences. Attorney Stefan Georg Hoffmann, who played Mr. Bakker (Managing Director of NedTrans) in the videos, gave the participants some insight into case analysis techniques and marvellously played his aforementioned role again, but still Prof. Berger was able to steal the show by playing "the quintessential runaway witness", as a fellow panellist remarked, during the cross-examination exercises. On the last day Dr. Stefan Kröll, LL.M. introduced the participants to the overall forms of awards and procedural orders, as well as the possibilities of settlements and the setting aside of awards. After the lunch-break the joint session of both summer academies followed, in which Prof. Berger presented the outcome of both proceedings and gave an overview over the similarities and differences. The Academy was concluded with the award of the certificates to the participants, who were applauded by their fellow attendees. In the end, the organizing team headed by Prof. Berger and especially Ellen Allerödder, the director of the CENTRAL, received their well-deserved ovations for making the Academies such an enlightening and memorable experience. This review can only give a small glimpse into the experience itself, but should definitely be understood as a strong recommendation to students and practitioners alike to take part in the upcoming Academies.